of those who do work with physical strength or skill / for wage earners especially manual or industrial laborers. E.g- 1. Last year GM announced plans to close four East Canadian factories and lay off 12,000 salaried and iblue-collar workers. 2. Four-year degree does not mean a person will earn more than a iblue-collar worker. 3. 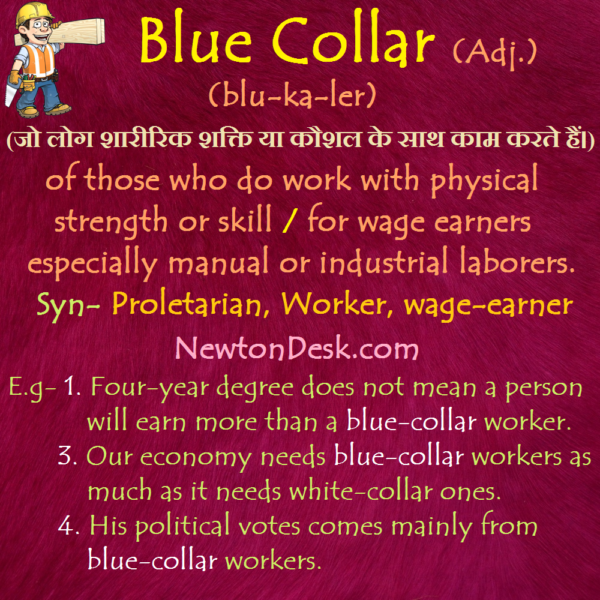 Our economy needs iblue-collar workers as much as it needs white-collar ones. 4. His political votes comes mainly from blue-collar workers. 5. Trudeau campaigned heavily on bringing back blue-collar jobs.